MOGADISHU (Reuters) - A suicide bomber attacked a popular restaurant in Mogadishu, the Somali capital, on Saturday, killing himself and at least three others, Somali police said. The attacker, dressed in a business suit over a suicide vest, detonated the bomb after entering the Village Restaurant, which is opposite Somalia's National Theatre, police said. "So far, three civilians are dead," Major Nur Ali, a senior police officer, told Reuters. 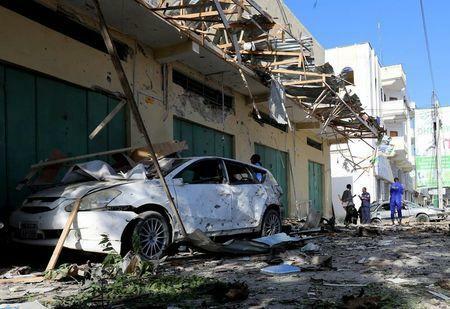 In comments on state radio, Somalia's information minister, Mohamed Abdi Hayir, blamed the attack on al Shabaab, the al Qaeda-aligned Islamist militants who wage frequent attacks in the capital as part of a campaign to bring down the Western-backed Somali government. "The al Shabaab suicide bomber did not cause many casualties," he said, adding that most of the people in the restaurant were able to escape before the bomb was detonated. A spokesman for the group could not be reached for comment.